i Click 'view all' to instantly compare this ok deal with offers on other top personalized hammers. 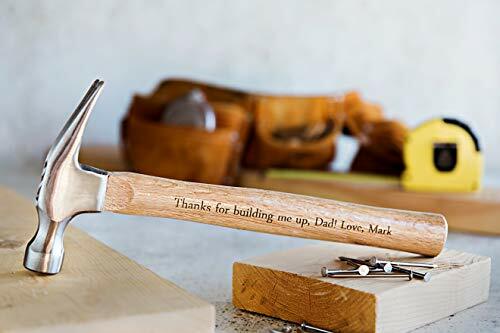 Personalized Engraved "Thank you for building me up" Wooden Hammer is currently selling at $37.49, approximately $0.31 higher than average. With a lowest price of $35.99 and an average of $37.18 it is selling on the high end of its usual range. Price volatility is 0.45% (meaning it does not change often), so you might have to wait a while for the price to drop. Right now this product is a recommended 'ok deal'. There is a coupon available for an additional 7% off. 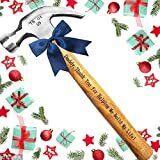 Compare the current price, savings (in dollars & percent) and Buy Ratings for the top Personalized Hammers that are closely related to Personalized Engraved "Thank you for building me up" Wooden Hammer. Here is how Personalized Engraved "Thank you for building me up" Wooden Hammer compares with other leading Personalized Hammers. We are passionate about creating items you love! Every item from Qualtry is uniquely personalized just for you. Each and every one of us at Qualtry loves to create, and are anxious to create something special for you. FeaturesThis is the perfect gift for that special man in your life. Click the Customize Now button and enter your personalization info.Dads, husbands, brothers, boyfriends, grandpas, uncles, step dads, father-in-laws will be delighted with this useful and sentimental gift.Every time they reach for a trusty hammer, they will be reminded of your faithfulness and love.This non-traditional and manly personalized gift is a great father of the bride and father of the groom wedding present. Say your Thank You as a couple with this tool that he will surely treasure for years to come.